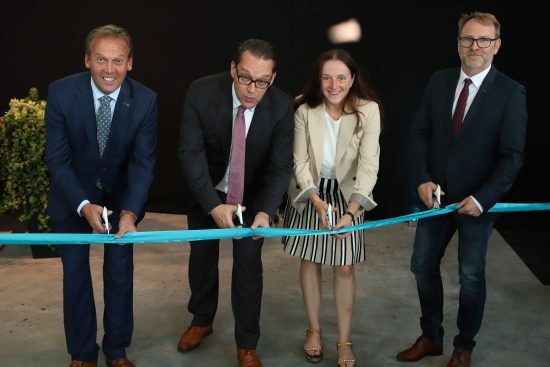 On 12 September, the new VMI extrusion technology center and manufacturing facility was officially opened by Mrs Karin Bucher, mayor of Cham and Mr Edward Holweg, COO of VMI, in the presence of employees and invitees. After VMI acquired the extrusion division of AZ Formen-und Maschinebau GmbH in 2004, VMI Extrusion continued at a location adjacent to AZ in Runding. The growth and ambitions of VMI with its extrusion equipment activities however required a more modern building. The new facility is located on the industrial area in Cham, Bavaria, Germany, ten kilometers from the former location in Runding. The VMI Cham facility and people play a key role in the development, engineering, testing and delivery of VMI’s extrusion equipment. This includes equipment for integration in VMI’s tire production systems and tire retreading systems as well as for VMI’s extruder program for the technical rubber- and tire industry. The production and assembly of VMI’s extruders takes place both in Cham and in VMI’s new production facility in Leszno, Poland. With the new facility in Cham, the new production capacity available in Leszno and the close cooperation between VMI extrusion technology center in Cham and VMI Global R&D in Epe, the Netherlands, we are ready for the future.